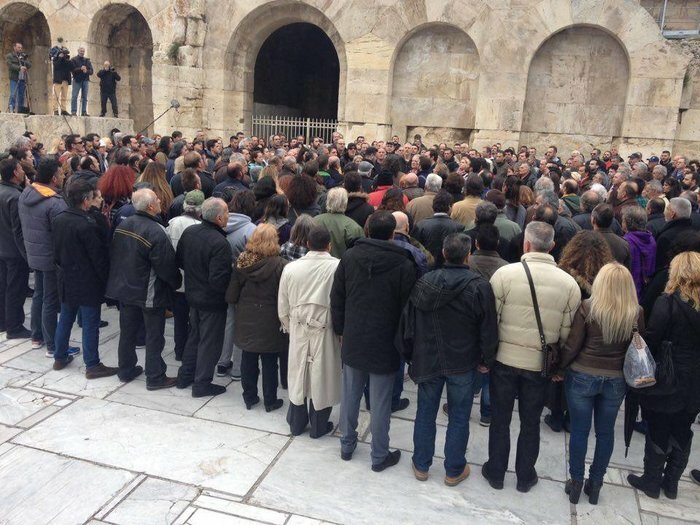 More than 300 people, members of the Assembly of Greeks, on Monday gathered outside the Odeon of Herodes Atticus at the foothill of Acropolis to declare their principles and pray to Zeus. The Assembly of Greeks is the political party of Artemis Sorras, the man who claims he manages a fund of 600 billion dollars in U.S. bonds that the Greek government is free to use to pay off the sovereign debt. Sorras has been recently indicted for fraud on another case. The Sorras followers listened to their leader express his ideas and values, including his exhortation to go to tax authorities and demand that their dues are paid using money from Sorras’ mythical fortune. Sorras’ proposed policy is a mix of patriotism verging on national socialism and the ancient Greek spirit including the worship of the 12 gods of Olympus.